The finalists of “Arab Idol” were as glamorous as Hollywood stars in their tuxedos and evening gowns, but their real lives couldn’t be further from the bright lights of the stage. The three hopefuls hailed from Syria, Egypt and the Palestinian territories - some of the world’s most troubled and unsettled countries. 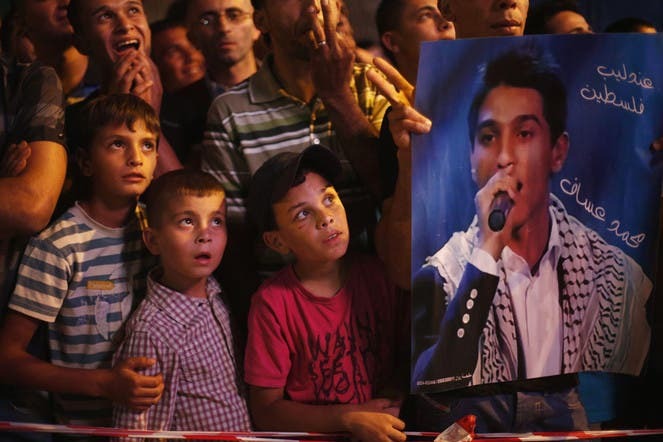 Palestinian Mohammed Assaf, crowned the winner on Saturday night, grew up in a refugee camp in the Gaza strip. He spent hours at border crossings and had to climb the studio’s back fence to arrive in time to secure a spot in the competition. “Spreading the words of young people and watching them achieve their dreams - this is much better than the sounds of gunfire that we are getting used to hearing in Palestine, Syria and around the Arab world,” said a beaming Assaf after his win. In Beirut, where the competition was held, outdoor cafes put up big screens and the sound of 24-year-old Farah Youssef’s voice drifted down streets. Youssef, from Syria, braved a treacherous terrain of gunmen and checkpoints to reach neighboring Lebanon to sing on stage. Across the region, audiences had been glued to their TV sets to watch the contestants, singing a mix of traditional Arab folk tunes and bubbly pop pieces, whittled down to the final three. The show also proved a platform to air political and social statements. “No one in the region talks about anything other than wars or Arab Idol,” said Lebanese judge Ragheb Alama. Parwaz Hussein, a semi-finalist from Iraq’s Kurdistan region, drew objections from some of the judges after listing her country as “Kurdistan.” She began the competition singing Kurdish songs though she later switched to Arabic. Numbering more than 25 million, the non-Arab Kurds are often described as the world’s largest ethnic group without a state. As crowds waving Palestinian flags rushed to lift Saturday’s winner on to their shoulders, Hussein danced on to stage with the Kurdish flag. Security guards quickly tore it away from her. In one of her final performances before the vote, Youssef surprised judges with a piece traditionally sung by men. She belted out “Songs of Aleppo,” evoking memories of the ancient city before it was divided by conflict. The young woman in a glittering emerald gown is a government supporter from Syria’s minority Alawite sect, but has brushed off sectarian slurs and complaints she should not be competing for fame as her country is racked by a civil war that has claimed more than 93,000 lives. “Our country is in pain, it doesn’t need more people to cry for it, it needs people to bring it pride,” she said.